Alaska residents had the highest well-being in the nation in 2014, reaching the top spot for the first time since Gallup and Healthways began tracking well-being in 2008. West Virginia and Kentucky rank 50th and 49th, respectively, for the sixth consecutive year. Hawaii and Colorado are on the top 10 list of highest well-being states for the seventh consecutive year. Alaska rejoins the top five in 2014 after being among this elite group from 2009 to 2011, while Hawaii finished in the top two for the sixth time, improving from the eighth spot in 2013. North Dakota tumbled from the top spot in 2013 to 23rd in 2014. North Dakota’s drop was mostly attributable to a drop in its residents’ overall life evaluation, coupled with worsened health-related behaviors such as higher smoking rates, reduced exercise and less healthy eating compared with 2013. 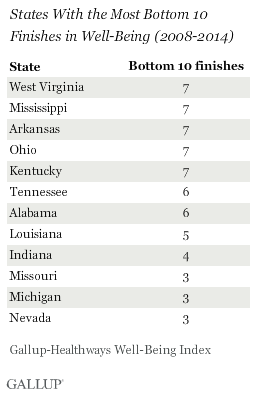 All of the 10 lowest well-being states in 2014 have frequented this list in the past. 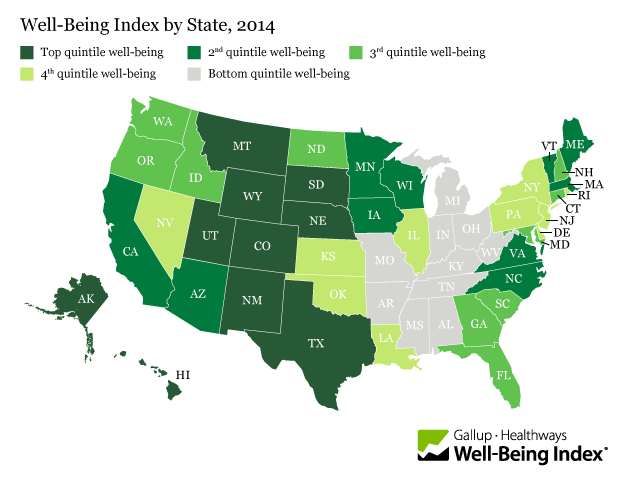 Gallup and Healthways have been tracking well-being since 2008 and updated the Well-Being Index in 2014 to provide a more comprehensive measure of well-being. The Well-Being Index scores for 2014 are not directly comparable to the scores from prior years because they are calculated using the revised instrument and scoring methodology. However, state rankings for 2014 can be compared to rankings from previous years. As in prior years, well-being in the U.S. exhibits regional patterns. The Northern Plains and Mountain West are higher well-being areas, along with some Western states and pockets of the Northeast and Atlantic. The lowest well-being states start in the South and move north through the industrial Midwest. 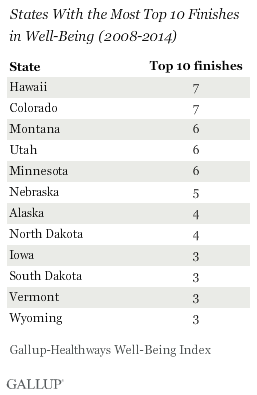 Hawaii and Colorado are the only two states to be in the top 10 for well-being every year since tracking began in 2008. In addition to these two states, 10 others have finished in the top 10 at least three times in the past seven years: Montana, Utah, Minnesota, Nebraska, North Dakota, Iowa, South Dakota, Alaska, Wyoming and Vermont. 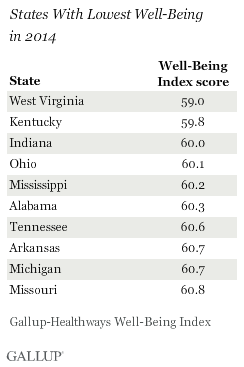 Arkansas, Ohio, and Mississippi join West Virginia and Kentucky as the only states that have appeared among the lowest 10 well-being states in all seven years of tracking. Alaskans, in addition to having the highest overall well-being, also had the highest ranking in purpose well-being across the nation. 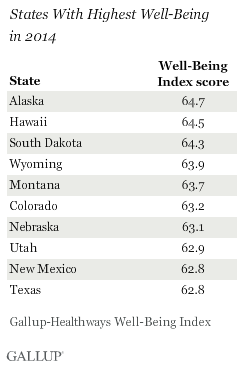 Hawaii (financial and physical) and South Dakota (social and community) each lead the nation in two elements of well-being. West Virginia (purpose and physical) is the only state to rank last for more than one element in 2014. Improving and sustaining high well-being is vital to any population’s overall health and economy. Previous Gallup and Healthways research shows that high well-being closely relates to key health outcomes such as lower rates of healthcare utilization, workplace absenteeism and workplace performance, change in obesity status and new onset disease burden. Well-being is also a predictor of business outcomes such as employee engagement, customer engagement, turnover and workplace safety, which can affect a population’s ability to reach its economic potential. High well-being is also strongly related to important societal outcomes such as lower rates of teen pregnancy and crime, as well as higher high school graduation rates and more charitable giving. Nationally, many aspects of well-being have improved in 2014 to their best levels since measurement began in 2008. For example, life evaluation, which is a key outcome of well-being and a high-level measure of how people think about and evaluate their lives,reached its highest recorded point in the U.S. in 2014. The rate of uninsured Americans fell to a low of 12.9% in the fourth quarter of 2014, indicating that millions of previously uninsured Americans now have insurance. And the Gallup Standard of Living Indexreached a seven-year high of +50 by the end of 2014. Other U.S. metrics point in the opposite direction. Obesity, for example, reached its highest point in 2014, climbing to 27.7%, and is now two full percentage points higher than in 2008. The rise in obesity coupled with improving metrics elsewhere illustrates the need for measuring well-being comprehensively, rather than focusing on one or two aspects. Regardless of national trends, states’ efforts to improve well-being should be customized to meet the needs of city and rural populations alike, always mindful of unique state subcultures. States and local communities can use well-being concepts and the five elements as focal points in designing and implementing initiatives to improve well-being. For example, Blue Zones Project initiatives in California, Minnesota, Iowa, Texas and Hawaii involve multifaceted programs and community actions aimed at improving many aspects of well-being. Specific interventions include working with schools, employers, grocery stores and restaurants to foster healthier choices. Other initiatives include working with governmental and other agencies to enact changes that increase opportunities for healthier lifestyles and community life, such as more walkable and bike-friendly environments, farmer’s markets and social activities. But perhaps the most important aspect of a successful program is a strong, uniform and sustained voice from governmental and organizational leadership, which can play a pivotal role in providing the foundation upon which a culture of well-being can be built. Results are based on telephone interviews conducted Jan. 2-Dec. 30, 2014, as a part of the Gallup-Healthways Well-Being Index, with a random sample of 176,702 adults, aged 18 and older, living in all 50 U.S. states and the District of Columbia. For results based on the total sample of national adults, the margin of sampling error for the Well-Being Index score is ±0.1 percentage points at the 95% confidence level. The margin of sampling error for most states is about ±0.6 percentage points, although this increases to about ±1.6 points for the smallest-population states such as North Dakota, Wyoming, Hawaii and Delaware. All reported margins of sampling error include computed design effects for weighting. 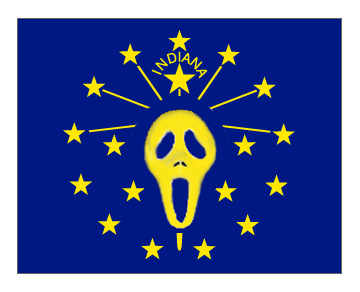 This entry was posted in Uncategorized and tagged community, health, Indiana, Kentucky, safety, well-being. Bookmark the permalink.